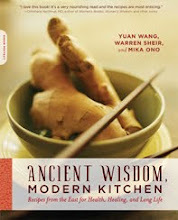 Ancient Wisdom, Modern Kitchen Blog: Yam or Sweet Potato? Since the topic of yams has come up in the last couple posts, I wanted to clear up some of the rampant confusion between yams and sweet potatoes. Not only do yams and sweet potatoes look similar, but, to make matters worse, most vegetables called “yams” in the local supermarket are actually sweet potatoes. So what’s the difference? These two vegetables are actually from unrelated plants. Yams, reputed to have rougher skin than sweet potatoes, belong to the family Dioscoreacae and originated primarily in Africa and Asia, although they also have a presence in Latin America. Sweet potatoes, which tend to taper to a point more often than yams, belong to the family Convolvulaceae and come from South America. If you are shopping for yams to use in a traditional Chinese food therapy recipe, you’ll want the true yams, which are available fresh and dried in Asian markets. The Chinese yam (a.k.a. Dioscoreae oppositae Rhizoma, mountain yam, shan yao or huai shan in Chinese, nagaimo or yamaimo in Japanese, goguma in Korean) is especially prized for its therapeutic properties. From the perspective of traditional Chinese medicine, the vegetable strengthens the qi and nourishes yin, supplementing the Spleen, Lung, and Kidney; it is often prescribed for diarrhea, provides a first-line food therapy for diabetics, and is recommended for long-term use to increase vitality. 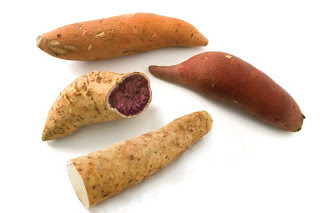 Other types of yams popular in Asia include the purple yam. Of course, if you enjoy sweet potatoes, help yourself! Sweet potatoes are packed with vitamin A and other nutrients. We just don’t know what the Chinese physicians of old would have thought of them.